For a road trip back in time, it's not really that far to go. 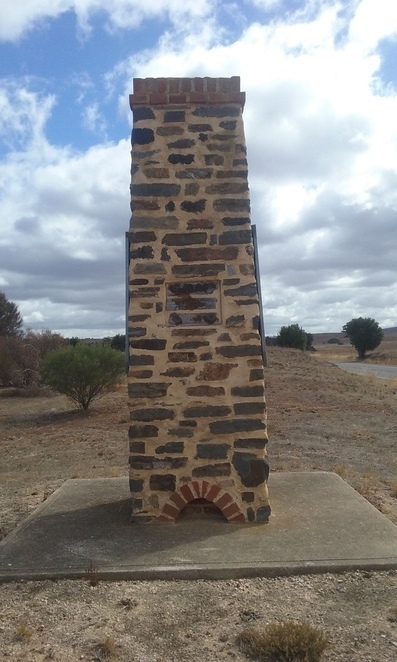 In fact, the little town of Callington and its surrounding areas of Bremer and Red Creek give a glimpse into mining and farming life back in the pioneering days of this mostly sheep and wheat country. Starting at the freeway exit, whether you're coming from Murray Bridge or Adelaide, turn toward Callington and drive through the town via the main road of East Terrace. Just on this 1km stretch, you'll find fine examples dotted about of miner's cottages with their short, front verandas, a door with a window either side and the remainder of the house stretching back behind it. The mine in Callington that these workers built their homes around was a copper mine that began in 1846. Once you've reached the end of East Terrace, turn left onto Old Princes Highway. A short distance along it on the left, after crossing the River Bremer bridge, you'll find a smelter chimney alongside an olive orchard. After recognising that there's more value in processing the ore on site rather than send it to Wales in the UK, smelters popped up all across South Australia from 1848 onwards with Callington having one of the first. The original smelter in Callington was built by Cornishmen and used a Welsh design. Interpretive signs on the chimney go into further detail. Further along, Old Princes Highway, turn left onto Callington Road and then turn right onto Back Callington Road. Along this road, on the left, you'll find that bits and bobs of old smelting infrastructure can be seen from the road such as the powder magazine, a chimney and what's left of the engine pool. Interpretive signs show what buildings were where. The old smelter works stand on private land so people are unable to enter the property. Further up Back Callington Road is the old railway station store and station master's residence on the right, the railway having been built in 1886. Both buildings are now privately-owned homes but still allow a glimpse into the history of Callington. The original railway station booking office and shelter is now at the National Railway Museum in Port Adelaide. From the old railway station, do a U-turn and head back to Callington Road and take a right turn at the end. Callington Road becomes Montefiore Street. Along Montefiore Street, some more of the old smelter can be seen. Turn right onto North Terrace. The school sits beside this intersection and the old school house can be seen on the right further up North Terrace. Beside the bend in the road where North Terrace and West Terrace, there is a safe place to park. This is where the best view of the ruined smelter can be seen, in particular, pillars for the lode, the chimney and the crusher engine-house. Doing a U-turn, head back toward the town centre and turn right onto Montefiore Street. Through the old centre of town is examples of yesteryear in the form of shop fronts (now homes), machinery, a car, numerous bicycles and more miner's cottages. Turning left onto Murray Street, a little further down on the left, you can see an old hall. Alternatively, you can turn right onto Murray Street, see the old Lutheran Church, built in 1865 that's still in use and loop back around by turning right onto Baker Street, right onto North Terrace, right onto Montefiore Street and left onto Murray Street. After crossing the narrow River Bremer bridge (only one vehicle width) turn right onto East Terrace and head out of town for about 8km. Along that stretch of road, you can see examples of ruined and still in use farmhouses, derelict water infrastructure, dry stone walls and also the Salem Lutheran Church and cemetery which is still in use. At the end of the 8km stretch, turn left onto Chauncey's Line Road. Right beside the intersection site the ruined Hartley Methodist Church which was in use from 1865 to 1895. Off to its right is another small, stone building; perhaps the manse for the preacher. The church hall is now filled with old tyres and a plaque stands to commemorate the pioneers of the area. Doing a U-turn, cross over Callington Road and onto Red Creek Road. 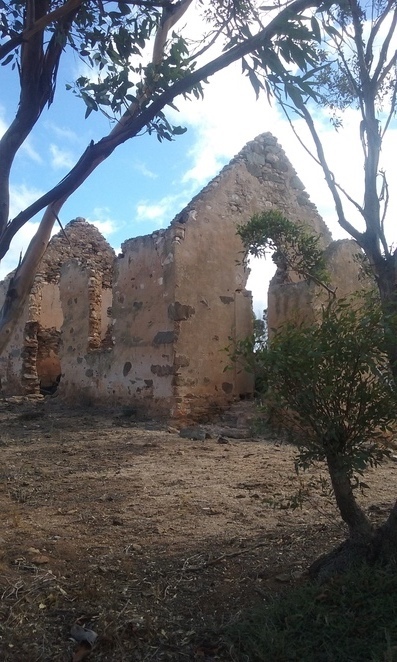 About 1km down, there is a ruined farmhouse and directly across the road is an example of old water infrastructure in the form of a rusted, corrugated tank which would have replaced the now-collapsed stone well. Stone wells were a common feature in water infrastructure. Being mostly underground and covered over meant they were free from much detritus making it safer for humans and livestock alike to drink. A further 2 to 3km down Red Creek Road is what's left of Red Creek village itself. A number of ruins stand here, each with a former purpose. Cracking open a book titled "Old Woodchester (Tin Pot) and Onaunga District Council area 1842-1992" by Eric Cross and Nancy Gemmell (available from the State Library of South Australia) will give a bit of an idea of the history of the area because, despite the number of ruins that remain, no interpretive signs or plaques let onto what life in Red Creek once was like. Across the road from Red Creek upon the side of the hill sits a new, modern water trough between a rusted corrugated tank and a dishevelled water trough. A concrete tank higher up the hillside serves the modern trough. Once you're done immersing yourself in the little-known historic areas of Callington, Bremer and Red Creek, there are two ways you can head home. Either by continuing on Red Creek Road to the end and turning right onto Wellington Road which gets you to Wistow (and of course its lovely bakery) or by doing a U-turn and heading back toward Callington, knocking off a few kilometres by turning left onto Lloyd Jaensch Road (going this way you'll pass more derelict water infrastructure) and then left onto Callington Road. If the latter is the path you choose, you'll get to the end of Lloyd Jaensch Road (at this intersection, turn left to head back to Callington) and notice a huge patch of Aloe Vera on the opposite side of the road, if you hadn't already noticed it on the way down. Aloe Vera and Peppercorn trees are such a common sight on old farmland as they are hardy, evergreen plants. Occasionally palms are common too. They were often planted as a status symbol as palms were quite expensive. If you're feeling peckish while in and around Callington, the town offers four places for a bit of a bite to eat such as Lavande of Callington, Elephant's Rest, Callington General Store and Bremer River Cottage. Fabulous article, thanks for all the fine details. And, welcome to WeekendNotes! Great article Teagan! Glad to hear Lavande is still going!